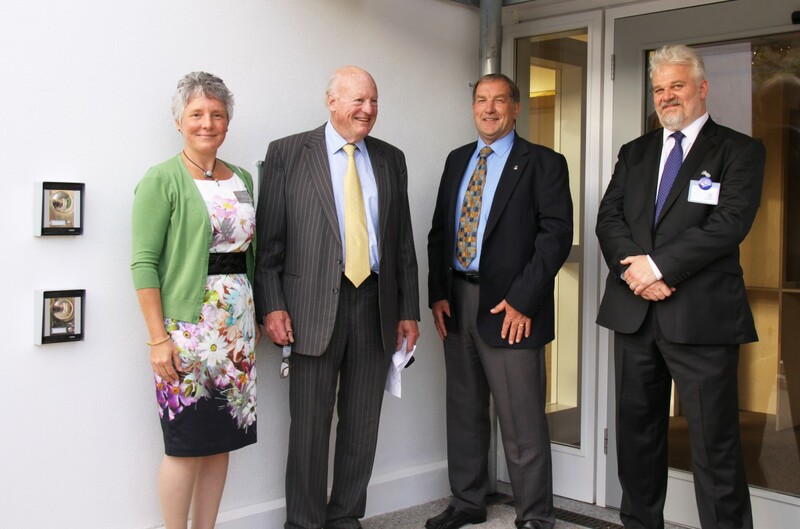 L to R: Tamsin Daniel, HLF; Lord Pender, Patron of The PK Trust; Dave Foot, Chairman of The PK Trust; Mark George, Chief Executive of Porthcurno Telegraph Museum. Following a celebratory day which saw a record-busting number of visitors, the museum has now closed its doors to the public whilst we continue with building work in the main museum buildings. We look forward to re-opening in summer 2014 with new visitor facilities and exciting new exhibitions. 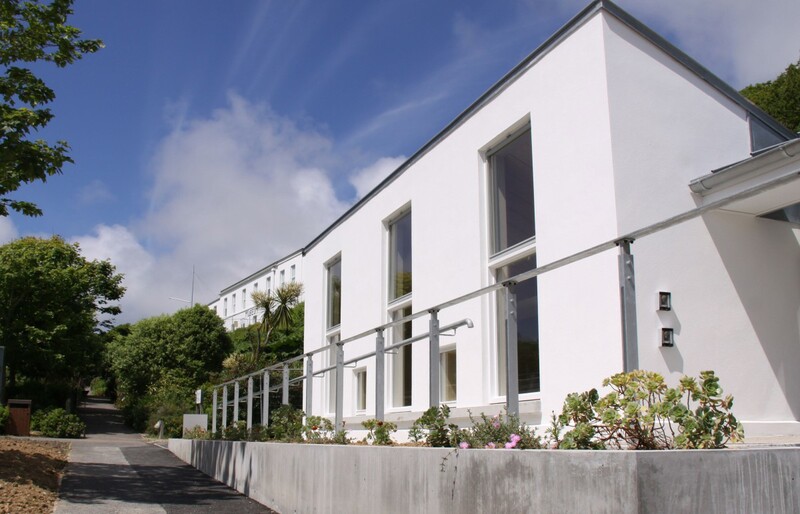 It is fitting that Lord Pender, the third Baron of Porthcurno and great-great-grandson of the telegraph pioneer John Pender, should unveil the commemorative plaque at the entrance to the new building; his ancestors’ portrait hangs in the new climate-controlled archive store which houses over 18,000 records. 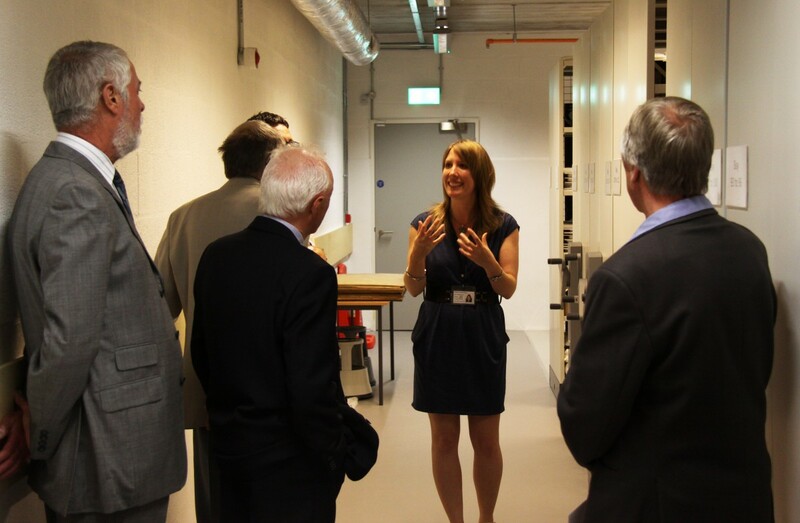 Collections Manager Charlotte Dando shows a group of guests around the new archive store. The museum’s project to develop for a growing and diverse audience has attracted funding from the DCMS/Wolfson Fund, the Coastal Communities Fund, the Clore Duffield Foundation, and Cornwall Council amongst others. For a full list of project funders, see the museum website. Heading up this support is the Heritage Lottery Fund (HLF) who awarded the museum a grant of £1.44m in early 2012. The opening of the new building also provided an opportunity to welcome the museum’s first Chief Executive, Mark George, newly in post. Relocating to West Cornwall to take up the new position, Mark recently headed the Heritage Lottery funded development of Chedworth Roman Villa and has spent 16 years in various roles with the National Trust. Mark’s role will be to lead the organisation, working alongside the Development Project Team, to secure the long term sustainability of the site. The new building has been designed by award-winning architects Long & Kentish.